Hilary Clayton: Biomechanical Interactions Amongst the Rider, the Tack and the Horse | Chronicles of a "Mini-Pro"
There is no doubt that how we ride our horses, the tack we use on them and the manner in which the horses carry themselves has a cumulative effect on their well-being over time. Whether that effect is positive or negative is one of the questions considered in the study of equine biomechanics, which combines the disciplines of physics and physiology to study how forces and work affect the body of the horse. Dr. Hilary Clayton is well known for the work she has done in this field, and she visited the University of New Hampshire in October of 2015 to share her thoughts on some of the more common interactions which occur amongst the horse, the rider and the tack. Clayton started her presentation with an overview of the structure of a horse’s vertebral column and how it works. Just like in humans, the horse’s spine is made up of bone, ligaments, muscles and discs; equine discs are relatively thin compared to a human’s, and therefore horses don’t suffer from slipped discs and disc pain like humans can. Even though the horse’s spine is horizontal, it loads similarly to a human’s in that it compresses together when force is applied. In this skeleton of an Arabian, it is easy to see the difference in the bones of the cervical and thoracic spine. Note also the proximity of the spinous processes. Each intervertebral joint has a small degree of mobility; when taken in totality, this allows for considerable movement along the entire length of the horse’s spine. The degree and type of movement which the topline displays varies with each gait. In the walk, there is some bending and rotation in the topline, but little flexion or extension. At the trot, there is more flexion and extension and the back is stabilized. At the canter and the gallop, there is a great deal of flexion and extension, particularly in the lumbosacral joint, and the back is stabilized. Instructors and trainers will often tell their clients that their horses need to move with a swinging back. Clayton explained that this statement is not wholly accurate. When in locomotion, the horse’s back must actually remain stable in order to support the horse’s weight and to transmit propulsive forces from the limbs. Clayton says that when the horse moves at liberty, they are not actively moving their back. The back movement we see is due to gravity, inertia and the propulsive forces of the hind leg. In fact, excessive mobility of the bones in the spine during motion is never the goal—it is the muscles which need to be supple into order to control the movement of the spine. Charlotte Dujardin and the incomparable Valegro. Photo by Florence Skowron, via Wikimedai Commons. Clayton compared the structure of the articulated vertebrae of the horse’s spine to a beam which has a support at each end. In the horse’s case, the “beam” tends to sag a bit in the middle, due to the weight of the internal organs and other viscera. When we add the weight of a saddle and rider to this region, we increase the hollowing of the spine and the “dip” in the middle of the beam. Clayton explains that with a rider, the range of flexion and extension is the same but the entire cycle of the motion is more extended. Through the above description, it should be immediately apparent that the weight of the rider is inherently causing stress on the horse’s topline. More troubling, though, is that when the horse’s back is hollowed as result of this weight, the dorsal spinous processes are approximated, which can lead to the development of the degenerative condition known as kissing spines. Clayton’s research has shown that far more horses are affected with kissing spines than just those which show overt symptoms; however, even at a subclinical level, the syndrome can cause the horse discomfort and reduce the quality of their performance. The good news is that when the back is rounded, the opposite effect occurs—the spinous processes are spread out. Therefore, regardless of your discipline, you horse should learn to work with a round topline. In this image borrowed from a fellow wordpress user, the kissing spines can be clearly seen. Clayton compared the mechanism which causes the horse’s back to be round to a “bow and string”. The “string” is comprised of the muscles on the underside of the bones of the back, in this case the abdominal and sublumbar muscles. The “bow” is therefore made up of the muscles located above the vertebrae. Rounding their back requires the coordinated action of the horse’s core muscles. Athletes of all species can achieve more optimal performance with a strong core. These muscles are important both for balanced movement and coordinated stabilization. Clayton divided the muscles of the horse’s core into three groups: the back muscles, the sublumbar muscles and the abdominal muscles, and the groups work in concert to achieve the maximum mobility of the horse’s spine. The back muscles make the topline hollow, round or bend right and left. The sublumbar muscles flex the lumbosacral joint and the pelvis, which helps to bring the hind legs forward and underneath the body. Finally, the abdominal muscles wrap all around the horse’s belly, running many different directions. This group of muscles includes the transverse abdominal, the obliques and the rectus abdominus. Collectively, they literally help hold the horse’s ‘guts’ in place, as well as stabilize the spine and assist with lateral bending. Clayton explained the function of the back muscles in more specific detail. First, she discussed the longissimus and iliocostalis muscles, which are the long mobilizing muscles of the back. They are made up of long fibers and cross many joints. These muscles are able to move the entire back of the horse. The multifadi muscles serve the function of stabilizing the horse’s back. These muscles are located right against the spinous processes and are comprised of short fibers which cross only a few joints; therefore, they work on only a limited area of the horse’s spine. However, the condition of these muscles can have a profound effect on the shape of the back in a specific area. More will be said on this later. Clayton pointed out that most muscles work in pairs or layers; therefore, the deep stabilizing muscles are as important as the long mobilizing muscles, as they help to prevent vibration in the horse’s bones. They also have a low activation threshold, which means that they will contract (along with the transverse abdominal muscle) simply in anticipation of locomotor activity. They then serve to stabilize the horse’s spine as the limbs move. Limited research has been done on the many effects of the horse’s stabilizing muscles on the spine. However, research done on humans has shown that chronic back pain is often associated with atrophy of the deep stabilizing muscles, as joints then become too mobile. Impaired spinal stabilization is an important risk factor and a predictor of recurrent back pain in humans. Based on her research, Clayton extrapolates that a similar connection exists in horses. Human research has also shown that even when back pain is resolved, the deep stabilizing muscles do not resume normal activity on their own. Physiotherapy exercises are necessary to re-train the pre-activation of the stabilizing muscles. In human patients who underwent this therapy, the one year recurrence rate of pain reduced from 80% to 30%. When it comes to back pain, Clayton says that horses go through a similar cycle to humans. When the back hurts, the deep stabilizing muscles become inactive, resulting in atrophy. This causes the long mobilizing muscles to compensate, but since they are not equipped to stabilize the spine, these muscles spasm and cause further pain. Therapeutic exercises are needed to reactivate the deep stabilizing muscles and to break the cycle of compensation and pain. Clayton has developed a series of core strengthening exercises and sequences through her research, and she goes into illustrated depth about these in her book, Activate Your Horse’s Core (Sport Horse Publications, 2008). She gave a brief synopsis during her presentation. Dynamic Mobilization Exercises are those in which the horse follows a controlled movement pattern which strengthens the muscles that move and stabilize the back. They are comprised of rounding exercises and bending exercises. In the rounding exercises, most of the flexion comes from the poll (high position) or the base of the neck (low position). In the bending exercises, most of the movement comes at the base of the neck. Image from http://www.horseyard.com.au, from an article related to Dr. Clayton’s work. Clayton described a protocol which provided positive results in several “couch potato” school horses. Using small bits of carrot to motivate the horse, they did three rounding exercises (chin to chest, chin between the carpi (knees) and chin between the fetlocks) and three lateral bending exercises (chin to girth, chin to hip, chin to hind fetlock). For the lateral bending exercises, the human stood next to the horse, making them bend their neck around the human. Horses did five repetitions/day and on left and right sides, if appropriate. The exercises were repeated five days/week for three months. Even with these stretches as the only form of exercise, the horses showed a positive development in their deep stabilizing muscles. One of the benefits of these exercises is that the horse will only stretch as far as they are comfortable. Ideally, the handler should encourage the horse to hold the stretch for as long as possible, but even stretching for a short period will help improve the strength of the multifidus muscle. The best benefits are seen when these exercises are performed before the horse works each day; regular inclusion of them in a training program will help equine athletes throughout their career. In addition, these exercises can be used in youngsters to help develop the deep stabilizing muscles before they begin under saddle training and are also especially beneficial for horses recovering from colic surgery, with appropriate approval from the attending veterinarian. When it comes to saddle selection and fit, it is clear that both the horse and the rider must be comfortable. While the rider can simply vocalize their discomfort, the horse must express it in other ways, and it is important for riders and trainers to remain sensitive to this communication. Unfortunately, the manner in which horses display the existence of back pain is as variable as the causes. However, both the saddle and the rider can contribute to discomfort in the horse’s topline, and certain issues are almost sure predictors of pain in the horse. Clayton has made extensive use of an electronic pressure mat which sits on the horse’s back in her research on saddles. This specialized mat has 256 sensors (128 on each side of the spine) which measure force distribution on the horse’s back. Her research has shown that the total force placed on the horse’s back varies with the size and weight of the rider and saddle as well as the gait of travel. For example, in the trot, the suspension phase has minimal pressure, while the stance phase of each stride has the maximum force. This is when the horse’s body is starting to rise up, but the weight of the rider is still down. The mean force placed on the horse is at least equal to the rider’s weight in the walk; in the trot, it is two times the rider’s weight and in the canter it is three times. This image, taken from http://www.sensorprod.com, shows the pressure profile of a rider’s buttocks and thighs on the saddle. Clayton’s tools offer her similar insight into the intensity, duration and location of pressure when a horse is in motion. Clayton says that she is frequently asked to quantify how much weight a given horse can fairly be asked to carry, but she says that this is a complex question to answer. Variables such as the height, weight, conformation, fitness and soundness of the horse all play a role. For example, a horse with a short and broad loin coupling can likely carry more weight than a horse of similar size with a long or narrow loin. As far as the rider goes, variables such as weight, fitness, symmetry, balance, postural control and health issues all influence the impact they have on a given horse. Also important is the activity the horse is being asked to do—what type of work and on what kind of footing or terrain. Finally, the saddle itself can have a positive or negative impact on a horse’s comfort level. Each saddle is unique in terms of its load-bearing area, fit and suitability for a given horse, rider and job. Soft tissues compress when pressure is applied. The larger the area the force is spread over, the less overall pressure there will be. This is one of the reasons why more modern saddles have long, broad panels. Pressure is calculated via force divided by area. Therefore, the pressure increases if the force is larger or if the contact area is smaller. Areas of deep pressure can be very harmful, causing ulcers or necrosis of the tissue due to increased capillary pressure. On a less extreme level, pressure can cause discomfort through abrasions. Clayton says that it is the magnitude and duration of pressure which are most important. Muscles in particular are easily damaged by pressure. If you see dry spots under your saddle after work, these are areas of increased pressure which prevent the sweat glands from working and are cause for concern. In this photo, it is clear where there has been an area of increased pressure and therefore inhibition of the sweating mechanism. In her research, Clayton has had cause to investigate a number of different areas in which saddles might impact the horse, and she shared some of her findings with the audience. One of the first questions she looked at was whether a saddle is truly necessary. Most riders prefer to use a saddle for the stability and security it provides them on the horse’s back, and as it turns out, horses seem to prefer that their riders use saddles, too. Without a saddle, the pressure of the rider is distributed over a smaller area, and the focal points of that pressure are over the rider’s seat bones. (Interestingly, Clayton found similar results when she looked at one brand of treeless saddle, as well). Clayton found that in general, a saddle which fits the shape of the horse’s back and the shape of the rider’s pelvis will provide stability to the rider’s position, and as a result, the pressure is more evenly distributed. She also mentioned that within a breed, 80-90% of animals will have a similar back shape. Correct saddle fit is of course of paramount importance. Correctly fitted saddles are more stable, which increases horse and rider harmony. The rigid parts of the tree, including the gullet plate, the points and the bars, can cause increased areas of pressure on the horse’s back. It is important to consider the width of the gullet plate and length of the tree’s points in relation to the position of the scapula and related muscles. When the horse extends their forelimb, the scapula rotates back and down on its back side, and rotates a little bit up in front. This causes the back edge of the scapula to actually slide underneath the saddle in this moment of the stride. A well fitting saddle should allow for free movement of the scapula when the forelimb is protracted. Clayton says that the width of the tree is equally important. The correct width allows the load to be evenly distributed over a large area. Ideally, the contact area is long and wide, with no focal points of high pressure. A tree which is too wide may cause the gullet to put direct pressure on the withers and/or cause high pressure along the panels close to the spine. In addition, the saddle often tips forward and down. A tree which is too narrow is one of the most common causes of bridging; there is more pressure at the front and the back of the panels, and the saddle tips backwards. Clayton says that bridging is the most common saddle fit problem, and it must be evaluated with the rider on board and while the horse is in motion. More nuanced aspects of saddle fit include assessing the width of the gullet and slope and shape of the panels. A wider gullet is usually better, because it allows mobility of the spine without causing it to hit the edge of the panels. The slope of the panels must also suit the shape of the horse’s back. Panels come in a variety of widths and curvatures, and it is important that the type chosen suits the individual animal. Finally, Clayton emphasized that saddle pads cannot compensate for the deficiencies of a poorly fitting saddle. However, they may increase the horse’s comfort if the saddle is essentially the correct size and shape. Clayton says that pads made with natural fibers, such as sheepskin, seem to have a better degree of resiliency and spring. Girth design has evolved considerably in recent years, and Clayton touched briefly on the subject at the end of her talk. She said that the highest pressure beneath the girth occurs just behind the elbow in the moment when the forelimb contacts the ground. In her research, contoured girths seem to do the best job in terms of reducing both force and pressure. Finally, Clayton discussed saddles which seem to constantly slip to one side. 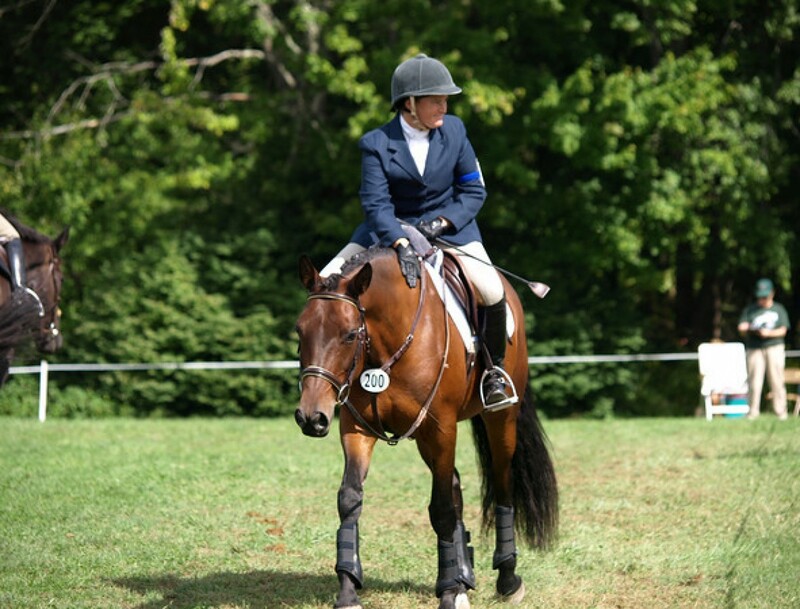 She says that it is important to determine if the cause of the slip is the horse, the rider or the fit of the saddle. Subtle hind limb lameness can be blamed for the cause of many slipping saddles, particularly when the slip occurs consistently to one side and with a variety of different riders on board. In 60% of these cases, the saddle slips towards the side of the lame/more significantly lame hind limb. The slip will go away when the lameness is eliminated through the use of nerve or joint blocks. Clayton commented that rider crookedness is more likely to be an effect than the cause of saddle slipping. Clearly if the cause of the saddle slip is lameness, this issue must be addressed before the problem will go away. Clayton’s presentation covered a broad range of topics, but one theme was quite clear—riders have an obligation to their horses to ride them in as correct of a manner as possible, in the best fitting tack possible. In this way, riders and trainers can actively contribute to the preservation of the horse’s long term soundness and promote their well-being. o	I’m glad I read this post, especially because I missed the first half of the lecture. It reinforced ideas I had forgotten from the lecture, as well. Dr. Clayton’s lecture was essentially the scientific “why” behind 402 lecture, which was lovely. The electronic pressure mat research was so amazing. As I wrote in a reflection of this lecture, I think there many, many more research possibilities with this technology. I think that what Dr. Clayton said about how much weight a horse can carry is very important…it’s much more complicated than a number.